My darling was reading a newspaper the other day and found "Sushi Burrito" is very popular overseas. Sushi rice gives perfect appetizing flavor over all!!! It is also perfect for Setsubun (Feb. 3rd)! 1. Place cooked Japanese rice in a bowl. Add Sushi vinegar while the rice is hot and slice through rice using rice paddle to separate the grains. Cool the rice before you use. 2. Make Wasabi Guacamole Japonés (video recipe available). 3. Divide the sushi rice into 4 portions. Spread the sushi rice on a flour tortilla using your finger tips, little bit moistened with water. Then sprinkle with toasted white sesame seeds. 4. In the center of the wrapper, layer lettuce, Shiso leaves, Wasabi Guacamole Japonés, shredded cheese, and chopped green onions. Then roll tightly. 5. 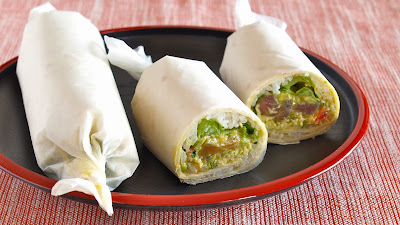 Wrap with parchment paper to serve.